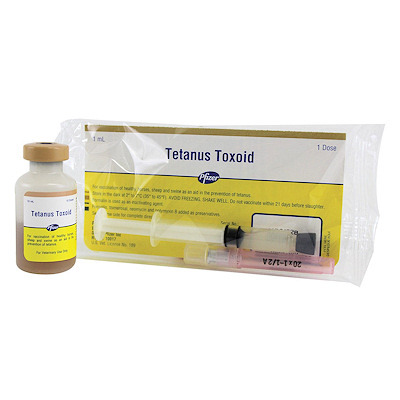 Tetanus Toxoid(Zoetis)single dose loaded in syringe with needle intended for vaccination of healthy horses, sheep and swine as an aid in the prevention of tetanus. Dosage: Horses, inject one 1 mL dose intramuscularly using aseptic technique. Administer a second 1 mL I.M. dose 4 to 8 weeks after the first dose. Revaccinate annually using one 1 mL dose.